The Learner Journal Collection offers an annual award for newly published research or thinking that has been recognized to be outstanding by members of The Learner Research Network. The winning article is selected from the ten highest-ranked articles emerging from the peer-review process. The author is invited to be a featured speaker at the next conference, where they are also acknowledged in a short presentation. Professional learning is integral to being in the workforce. In this article, “professional learning” ranges from student preparation for work, to the ongoing development of graduates in their careers. Given the rise of corporate learning academies and other capability-building programs within organizations, and the changing nature of work, this article highlights a need for universities to reimagine professional learning approaches. We argue that professional learning needs to be considered as a continuum by universities, employers of graduates, and graduates themselves, beyond current ideas about work-integrated learning. Otherwise, the risk is that universities will be left behind or left out of the evolving world of professional learning. We believe the transition between university studies and workplace careers will be smoother and more meaningful if professional learning approaches are aligned, with the student/employee learning journey centre stage. This article uses a comparative personal narrative methodology in exploring what can be learned from the experience of university educators to inform future models of professional learning. Based on the literature and practice examples discussed, future models are likely to include a clear focus on motivation for interdisciplinary social learning in networks. This involves a combination of mobile technology and face-to-face experiences, with a sense of belonging fostered for collaborative “meaning making” and enhanced personal and organizational productivity. It is vital to understand the learner context and culture, enable iterative practice using best-fit technology, and encourage critical reflection for transfer of learning to new situations. Developing a mindset that professional learning is a continuum – from student preparation for work, to enhancing careers and performance of organizations – is relatively under researched. This article attempts to address that gap and suggests a framework for reimagining professional learning. Work integrated learning has been discussed widely for many years as providing a strong foundation for “work readiness” of graduates. However, that discussion has been largely about supporting students as they prepare for work, rather than also preparing for the kinds of professional learning experiences they are likely to encounter in the workforce. In parallel, organizations have been agile in the rapidly evolving digital world, moving ahead with their own learning academies and other capability-building programs to improve work transitions and organizational performance. There has been little discussion on ways in which the professional learning continuum can be approached collaboratively and more seamlessly to incorporate student preparation for work, ongoing development of graduates, and improvement of organizational productivity and performance. In the absence of such discussion, graduates may not be well prepared for their future learning programs, although technological developments continue to transform work and the associated professional learning required to keep up and keep ahead. Through industry/university partnerships, the future directions of professional learning can be shaped collaboratively. The suggested framework of Key Success Criteria for Professional Learning Models highlights motivation for interdisciplinary social learning in networks, with critical reflection-in-action for adaptive capability development. Further research is needed to translate and refine the framework in other university and organizational contexts, building upon work integrated and work transition learning approaches already in play. Peterson, J. Fiona, Cathy Lockhart, Kerin Elsum, Bronwyn Clarke, and Catherine Raffaele. 2018. "Professional Learning: A Continuum Reimagined." 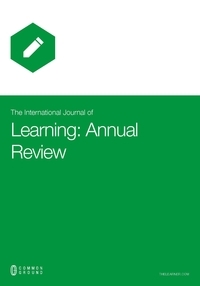 The International Journal of Learning: Annual Review 25 (1): 39-55. doi:10.18848/1447-9494/CGP/v25i01/39-55.